The SANUS VuePoint FLF215KIT is a complete all-in-one kit for a professional looking finish. 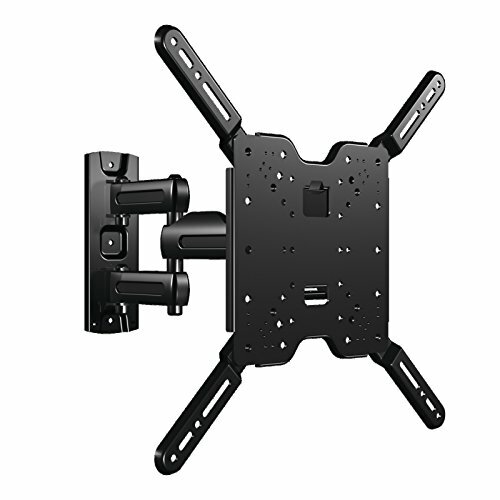 The versatile full-motion wall mount fits most 37" - 80" flat-panel TVs up to 100 lbs. Its full range of movement allows smooth extend, tilt, swivel and roll motions up to 14" from the wall without the use of tools. The FLF215KIT tilts +10º / -11º with the touch of a finger, making it easy to reduce glare. Cable management system conceals and organizes cables for a seamless appearance. Side-to-side shift ensures perfect TV placement, even with off-center wall studs. Also includes a 10' HDMI cable, surge protector, 5 cable ties and screen cleaner & cloth. Includes a 5-year limited warranty. Versatile full-motion wall mount fits most 37" - 80" flat-panel TVs up to 100 lbs. Side-to-side shift ensures perfect TV placement, even with off-center wall studs. Includes a 10' HDMI cable, surge protector, 5 cable ties and screen cleaner & cloth.